While helping her granny Collette evacuate to a makeshift shelter in Brooklyn during Superstorm Sandy, Lily uncovers secrets of her grandmother's past as a member of the French Resistance during WWII. Hurricane Sandy is flooding New York City, and Lily is at a nursing home with her grandmother, Collette. Lily visits Collette often, as she is beginning to lose her memories. When the National Guard shows up to evacuate the building and take them to safety at the Park Slope armory in Brooklyn, Lily's granny suddenly produces a red box she's hidden in a closet for years. Once they get to safety, Lily opens the box, where she finds an old, beautiful Montblanc pen. Granny tells Lily that the pen is very important and that she has to take care of it, as well as some letters written in French. But Lily loses the pen in the course of helping other nursing home residents, and as she searches the city trying to find it, she learns more about her grandmother's past in France and begins to uncover the significance of the pen with the help of her best friend, a quirky pen expert, and a larger-than-life, off-Broadway understudy. Told in alternating sections (2012 and 1944), this engaging book explores a deep friendship during difficult times and the importance of family. Anne O'Brien Carelli is the author of adult nonfiction and the picture book Amina's New Friends. She has always been fascinated by the French Resistance, and studied history at Case Western Reserve University. For her PhD, Anne researched psychology of the gifted. Originally from Ann Arbor, Michigan, Anne lives in the Hudson River Valley in upstate New York. This is her debut middle grade novel. 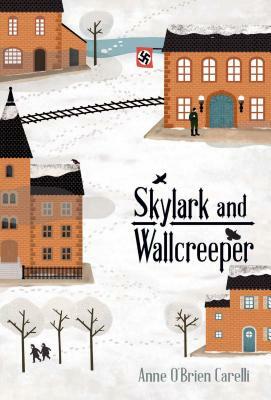 Skylark and Wallcreeper is full of girls who just won't give up, whether they're facing Superstorm Sandy or resisting Nazi occupation during WWII. Anne O'Brien Carelli vividly weaves together historical and contemporary storylines to craft a tale of curiosity, courage, and kindness. Prepare to get swept up in a rich, page-turning adventure that spans generations! A solid next choice for those who enjoyed Kimberly Brubaker Bradley's &lt;i&gt;The War That Saved My Life&lt;/i&gt; (2015) and Alan Gratz's Refugee (2017). [C]arelli realistically depicts the warm, complex relationships between daughter, mother, and grandmother.